Going out of town can be stressful enough as it is, but when you’re a dog owner you have to figure out how your dog will be taken care of in your absence. For most people, it comes down to two options: hiring a dog sitter or placing your dog in a boarding kennel. There are many factors that go into this decision including price, the comfort of your dog, the safety of your dog, and you trust in the care they will receive. While boarding your dog can seem like a good option, more often than not, your dog is going to greatly appreciate being able to say in the comfort of their own home. Reach out to your local dog sitting company for more information and to schedule a meet and greet for your dog and sitter. Fortunately, kennels have seen a lot more improvement in recent years and aren’t usually the cold, concrete, and steel cages your picture. 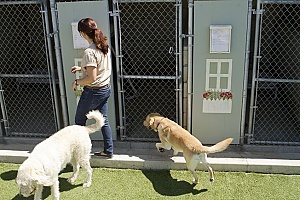 Boarding kennels have started to shift to becoming more like pet hotels with increasing the amenities they offer. While these amenities can include things like pools, one-on-one play dates, and massages, they can really start to drive up the cost of your dog’s stay. The more personal attention you want your dog to get, the more it’s going to cost you. However, the more personal attention tends to help your dog feel more at ease and comfortable in a strange and new place. A major factor you have to consider when deciding in a boarding kennel is right for your dog is how stressed they will be in that environment. Some dogs just can’t handle it and have to deal with vomiting and diarrhea while they are boarded. You also have to worry about your dog’s safety with they are interacting with other dogs. Dog sitting solves many of the problems that boarding your dog can present. Your dog will be stress-free in their own home, will be able to receive personalized care and attention, and you have the comfort of knowing the dog sitter is well-trained. Dog sitting can be completely personalized to the needs of your dog. They have different options where a sitter can come for 30, 45, or 60 minutes to take care of your dog and spend time with them. If you are worried about your dog being left alone overnight, you can have a dog sitter come to stay in your home. Overnight stays are for a total of 12 hours and begin between 7-10pm. A 30 minute evening and morning walk is included. You can also schedule additional mid-day visits as needed. Because you have so many options, you can easily pick one that fits within your price range. Many of the extra amenities you would have had to pay for in a dog kennel to reduce their stress levels are already in your home. Your dog will have their own brand of food, toys, and bed to make them feel more relaxed. Not only is a dog sitter great for your dog, but they can also keep an eye on your house while you’re gone. They can bring in the mail and newspaper, water your plants, and inform you if anything should go wrong. It’s even possible for you to have them clean up your yard after your dog does their business, and to have them pick up any supplies your pup may need while you’re gone. Professional dog sitters are also a better option than having a friend or family member stay with your dog. This is because they are often trained in Pet CPR and first aid, so they going to know the signs to look for and what to do in the case of an emergency. They are much more likely to recognize the signs of a potential health problem than your average person. They will also be trained on how to properly administer any medications your dog may need. Some dog sitting companies even have the option of allowing your dog to stay at the dog sitters house. This is a great alternative to a dog kennel because they get to be in the comfort of the dog sitters home, and they will receive personalized care and attention. 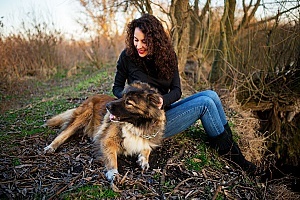 The dog sitter may also have other animals that your dog can interact with. This could be a great option if your dog has already bonded with your dog sitter, so you know your dog will be comfortable in their home. Hiring a dog sitting company is surely the best way to give your dog the most stress-free experience while you are out of town. Boarding kennels just can’t compete with the individualized care and attention a dog sitter can give.